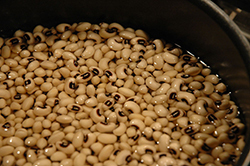 Black-eyed peas, pork, collard greens — where did New Year’s Eve dinner originate? Typically, I plan party food according to two basic rules: One, make it delicious, and two, present it in a discrete form that can be picked up and brandished in the course of energetic conversation without spraying crumbs or dip everywhere. But for New Year’s Eve, which I usually spend with a close cadre of friends, I am willing to break the rules for lucky foods. New Year’s style so often seems to highlight glitter and glamour: Sparkling beverages, spangle and shine on the clothes, twinkling lights — but the food is down-home, humble but filling and delicious. I simmer black-eyed peas to creaminess with a ham hock in a slow cooker. I leave the pork out of the collard greens in case of vegetarian guests, but I caramelize the onions with a smoky salt and deglaze with wine to make this humble green a little dressier for the occasion. Soft, round rolls and the various offerings of other guests finish off the meal. Napkins are required. When we eat, I recite a litany cobbled together from memory and the Internet: The green folds of collards represent paper money and prosperity; the pork is a nod to the forward progress of the pig, who can’t walk backward; the black-eyed peas are looking to the future. The last line is cribbed from my mother, who said so when she served pork chops, sauerkraut, and black-eyed peas for the New Year in Tennessee, where I grew up. When I reminded her of this on the phone recently, she burst into laughter. “I don’t remember saying that,” she said. A former grade school teacher, she is an expert at improvising plausible theories when questioned by curious young minds. (My brother and I certainly would have questioned the beans and sauerkraut, which didn’t strike our not-yet-matured palates as particularly auspicious.) Aside from her homespun theory, she didn’t know why black-eyed peas were served at the New Year; that was her nod to the traditions of her chosen Southern family. She herself grew up in Pittsburgh; the pork chops and sauerkraut were the lucky foods she ate with our German immigrant relatives. But pork and greens are traditionally a part of the Southern New Year, too. I began to wonder where these traditions came from, so similar for two regions miles apart and usually considered quite different in cultural disposition. Many back issues of old periodicals later, I still don’t have a clear answer — only loose folkloric connections. 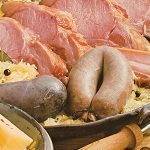 Pork and sauerkraut, for example, are still traditionally eaten for luck in Pennsylvania German communities. Pork is eaten at the New Year because pigs “root forward” for food, unlike chickens, which scratch backwards when scavenging (and thus are avoided for this celebratory meal). Sauerkraut is eaten at the New Year because… no one knows. At least, no sources seem to explain why it’s a particularly lucky food; why it’s eaten in the dead of winter can probably be attributed to the availability and plenitude of this fermented product of the hardy cabbage. But my Pittsburgh relatives aren’t Pennsylvania Germans — just Germans living in Pennsylvania, which is not the same thing — and there is not much to connect the pork-and-sauerkraut practice to the last century’s New Year’s traditions in Germany. (Modern Germans focus more on the midnight fireworks than on food, although their cheerful marzipan-sculpted “lucky pigs” are probably a nod this plump, pleasure-loving creature’s cross-cultural associations with prosperity.) Why a family of urban laborers picked up the traditions of a loosely related but largely rural community is a story lost to time. 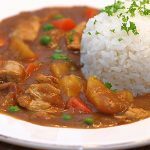 If any culinary history were lost to time, though, it would be the genealogy of Southern food, a hodgepodge of traditions that emerged from a cultural mix as diverse as any immigrant-settled city. The Southern United States introduced landowning and indentured laborers from colder parts of the world to laborers, free and bound, from hotter parts of the world — and in order to survive in a region fraught with economic hardship, seemingly disparate cultures mingled together. Surely, for example, German immigrants brought their lucky pork and cabbage with them to their Southern settlements, although they found it easier to grow other members of the cabbage family such as kale or collards. (Tough, fibrous collards have a surprisingly cosmopolitan history, cultivated across multiple continents for the last millennia.) Black-eyed peas arrived by way of trade with West Africa and West Indies — as did okra, another Southern staple. 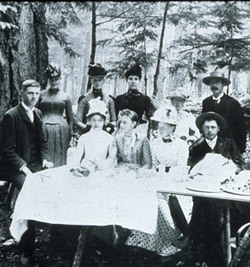 The Native American crop corn put corn bread (and, later, bourbon) on the table. The mingling of these cultures created a culinary mix of belly-filling, rib-sticking foods that can no more be separated into distinct cultural classes than the hog jowl can be separated from the hoppin’ john after simmering together all day. Despite the diversity of this bounty, nearly every source traces the symbolism of Southern New Years dishes to a specifically financial kind of luck. The greens represent paper money, as I had heard before; black-eyed peas represent coins; corn bread alludes to gold. But one might wonder: Do Southerners eat peas, greens, and pork because they remind us of prosperity? Or do they remind us of prosperity because we have them to eat? Like the Pennsylvania Germans’ sauerkraut, peas and collards are inexpensive and available even in the wintertime. They are foods to feed the masses: Dished up by the dripping spoonful, they create an appearance of plentitude that it would take many more fussily prepared hors d’oeuvres to equal. They are traditionally prepared with savory seasonings — salts, animal fats, hot spices — that turn a humble harvest into a rich, satisfying meal. Perhaps earlier Americans found pork, greens, and beans to be lucky foods because it was a kind of luck or kitchen magic to create bounty out of the winter’s scarcity and struggle.